The Royal Australian Navy has taken ceremonial delivery of its first two MH-60R ‘Romeo’ Seahawk helicopters in a ceremony at Lockheed Martin’s Owego, New York facility on Tuesday. The first two of 24 MH-60 Romeos being acquired under AIR 9000 Phase 8 to replace the S-70B Seahawk and the cancelled SH-2G Seasprite capability were handed over a day ahead of their planned ferry flight to Jacksonville, Florida where the RAN’s 725SQN will transition onto the type over a period of 12 months ahead of bringing the Romeos to Australia in late 2014. The two helicopters, N48-001 and -002, will be formally accepted by the RAN in January after they are placed on the Australian military register once acceptance testing is completed at Jacksonville. 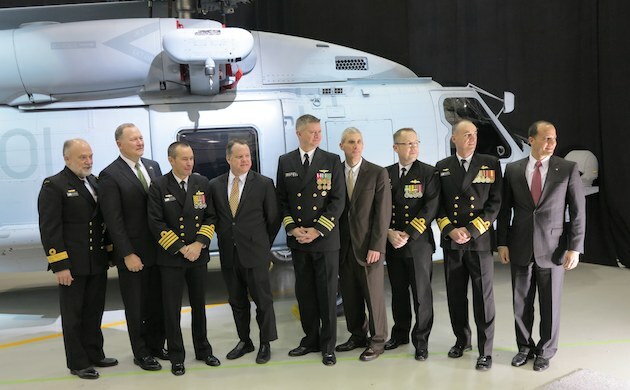 “I want to emphasise that from the Australian government’s perspective and from the Royal Australian Navy’s perspective, this aircraft is a game-changer,” RADM Tony Dalton, Head of Helicopter Systems for the Defence Material Organisation, told the ceremony. RADM Dalton also stressed that the delivery ceremony was just one key milestone in an ongoing partnership between Australia and the US on Romeo. “The quality of the partnership gives me great confidence that we will be able to fly these aircraft into the future at the rate that we need to and in the spaces and places we need to,” he said. The MH-60R is built by a teaming of Lockheed Martin and Sikorsky. Sikorsky builds the MH-60R at its Troy, Alabama and Stratford, Connecticut facilities, while Lockheed Martin is responsibility for systems integration at its Owego plant. RAN, DMO and Team Romeo officials at the MH-60R hand over. Nice smooth acquisition for the RAN. Did we really need to send over so many staff for a taxpayer junket in the US though. I look forward to the media statement that explains away the requirements to be able to conduct utility operations – load lifting, personnel transfer – the very tasks our S-70B-2 have predominantly been doing for the last 23 years. Number of submarines actually engaged during their service life? Nil. Number of at-sea loads lifted, people moved – thousands. Given that the only aircraft on our frigates will be a Romeo (the MRH90 will be embarked in the larger support ships and LHDs), we have now arguably gone backwards in real capability. Given that the largest fleet of helicopters in ADF service will soon be (already is?) the MRH90, I still think it would have made more sense from a supportability, and capability, point of view to purchase the NFH version of the NH90 – an aircraft that may only have been 90% of the Romeo’s ASW capability but was 1000% better at doing the real-life tasks these aircraft are required to do, and will increasingly be required to do in the future. Another great opportunity missed by the ADF and DMO, and another mis-spend of taxpayers money. Another shining example of obtaining a proven capability via the US FMS system, ahead of schedule and within budget too! I wonder where we would be at today if the naval version of NH-90 had been chosen instead? I doubt we would be seeing two service ready aircraft in our possession. It’s also another great example of how the ADF has developed a very close relationship with the US military, specifically the USN. One would expect that the entry into RAN service will go pretty smoothly, just as the Super Hornets did with their entry into the RAAF. And there’s more to come via the USN in the not too distant future, Growlers, P-8A’s and eventually (hopefully) the Triton too. I must say I’m rather confused with your comments. The Navy has replaced 6-7, 35+ year old, Sea King utility aircraft with 6 new MRH-90’s, they are also in the process of replacing the 16, 25 year old, S-70B-2 Seahawks with 24 new MH-60R Seahawks, and you say the Navy has ‘gone backwards in real capability’, how?? You appear to be placing great emphasis on the ‘utility’ aspect of the older Seahawks (despite the fact their primary role is ASW), I’m being polite here, but I’m not sure if you understand that the new MH-60R’s, apart from their main ASW role, also have a secondary ‘utility’ role too. The new Romeos will not only be far more capable assets in the ASW role, they also have an ASuW capability too, and as far as the ‘utility’ role is concerned, they can also perform SAR, VERTREP with an underslung load and there is also room in the cabin to carry passengers too. Happy for you to have your opinion, and I’m not asking you to believe me, but have a bit of a look at the publically available information on the MH-60R and you will see what I mean, gone backwards in capability? Definitely not. As for the MRH-90, getting there but still a way to go, I think if the ADF had a choice (and not the one their political masters imposed on them), we would be seeing new Blackhawks in the Army and Navy utility roles. The Naval NFH version? Still even further to go, not to say that the NH-90 family won’t eventually be good aircraft, once they mature, but they are not there yet, and I don’t think the RAN has the time to wait for that to happen. I agree with much of your comments. The MH-60R is indeed a superlative ASW and ASuW platform, and the capability is indeed sorely needed in the RAN. My comment stems from the fact that the “real-world” tasks that have been undertaken, and will continue to be undertaken, by our aircraft are predominantly of a “utility” nature. Whilst the S-70B-2 are “primarily” an ASW platform, their “real-world” work has been almost exclusively of a utility nature – SAR, HADR, DACC, VERTREP. The MH-60R is NOT a utility aircraft. This role is undertaken by the MH-60S in USN service. Whilst the sales pitch credits it with secondary capabilities, these can only be achieved after significant reconfiguration of the aircraft. It does not have a cargo hook fitted, although one CAN be fitted. It does not have any real internal passenger capability, although passengers CAN be carried provided you remove all of the mission equipment – a task you may know is problematic. My point is that we have essentially lost a utility capability from our frigates, or at least lost an easily available capability. To my way of thinking purchasing an ASW, ASuW and utility capable aircraft – capable without reconfiguration – albeit with only 90% of the ASW capability represented by the Romeo (for now), but with common logistics and training pipeline as the largest fleet of helicopters in the ADF, that has growth potential (i.e. is not already at the end of its development life, not overweight) and has modern safety systems installed (Romeo has NO FLOATS) would have been better value for the Australian taxpayer. I understand my voice is certainly in the minority, but we should be careful not to over-gild the lily here. I suspect the 40-year old design Romeo is going to look pretty tired in 5-10 years time. There is no doubt that ‘on paper’ the NH-90’s are impressive aircraft, and I’m sure if you put a list of capabilities of the NH-90 family and the MH-60 family side by side, there would be plus and minus on both sides of the list. But here in the real world of ‘today’, the NH-90 family has failed to live up to the promises, not to say that eventually with enough money and development time that they won’t, but how long could we have waited for that promise to turn into reality? The last three big ‘Euro’ purchased the ADF has made, eg, Tigers, KC-30A’s and MRH-90’s, have all looked good on paper, have all had their share of major problems, and problems still exist today, I’m not anti Euro, but the reality of the delays and problems with Euro products speaks for itself. Today there are more than 160 MH-60R’s in service, today there are probably around a dozen or so NFH-90’s in possession of their operators, but would you consider them be to be fully operational yet? I don’t think so. Anyway, I think we will have to politely agree to disagree! Firstly the NFH is too big to fit on the AWD without huge and high risk modifications. Second don’t get sucked in by EC/AA about what the NFH can do – it’s not certified to fire the torpedo, and they haven’t even started missile system might integration, so at this point in time NFH = no ASW or SuW capability, and those things might not ever happen. If we’d gone NFH you’d be reading about a project of concern today, instead of a project delivering ahead of time. Red Barron, we sent two (2) people to the states for the handover. The others you see in the photo are yanks, plus one aussie who is permanently based in the US. I’ve no doubt the two people we did send managed to combine the trip with a whole of other stuff. The success of the project is testimony to the value getting face time to build relationships. I maybe wrong but I count at least 4 in RAN Naval formal uniforms and a possible few civillians from DMO? Like the UK navy we have our war medals as small versions for formal dress and the US use that checkered style. Also I believe US formals are white??? Thanks Victor, good to know. you’re both right and wrong. There are five (I think) gents in RAN uniform. 2 of them travelled to the US for the handover and other activities. They were the DMO project manager (Captain Lockey) and Head Helicopter Systems (RADM Dalton). The CMDR second from the right is the squadron CO, and he is based in the US with the rest of his team. I don’t know the CDRE or the CMDR in the middle but my guess is that they are the Defence and Naval attaches, also based in the US, as the definitely did not travel for the handover. I know that no DMO civilians travelled, and assume that the civvies are part of the US Team Romeo. This is the smartest and most economical purchase we could of made. These birds are proven and our allies also use them. No brainer!!!!!!!!!!!! Really guys? This is a $2bn acquisition and you’re bitching about a few guys travelling to the US for the handover?